I’ve been thinking a lot about stories this spring. I’m pretty sure it was kicked off a few months ago after hearing that a friend of a close friend who was a storyteller was sick. My friend sent me a link to his CaringBridge page, where his wife Laura who is also a professional storyteller was telling the story of his battle with pancreatic cancer. I know Kevin through the MIT Media Lab. He had just graduated with his PhD when I started working there many years ago. To be honest, I’m not even sure if we met during my years at the Lab. I only recall meeting him once after I had left and I’m not even sure I have the time and place right. However, my friend Angela, always talks about him with such warmth and he was part of a place that has been like family. I was saddened to hear that he was ill. Weeks passed. I hadn’t stayed on top of checking Kevin’s CaringBridge page. Late in March I was wondering how he was doing but didn’t remember to check back. A few days after he passed, another friend sent me an email to let me know. I thought about Kevin and his family all through my work on the Marathon Scarf Project. That’s probably why I was thinking so much about the thousands of stories that the scarves wanted to tell. I was posting a lot to our Ravelry forum about the work that was going on behind-the-scenes at Old South. Three weeks after Kevin died I was surprised, touched, and honored when Diane Gaucher (co-coordinator for the project) referred to me as a storyteller in a thank you post on Ravelry. I have never thought of myself as a storyteller. When I hear the word “storyteller” I think of lute-playing bards and stand-up comedians – people who can get up in front of a crowd and captivate everyone in the room. I hate public speaking and I am terrible at telling jokes and stories. I’m liable to stumble my way through and forget the most important parts. I can write, but I had never considered my writing to be storytelling. I pondered Diane’s words for a few days. I thought about Kevin. I thought about storytelling. I realized that since I’d started craft blogging, I now had a wider platform outside Ravelry from which to tell the stories of our scarves. I can’t do anything to change the fact that Kevin died far too young. All I can do is remember him. I thought the best way to honor his memory was to tell stories. That’s part of what motivated me to write Dear Runners. So I’d like to belatedly dedicate my Dear Runners post to Kevin. I have heard from many people that in life Kevin always encouraged people to tell their stories. Even after death, Kevin encouraged me to tell stories. I thought people should know that. Next time you tell a story, please think of Kevin. ← I heard from another scarf recipient! This is wonderful, thank you. I’m glad you were there. I’m sorry we didn’t have a chance to connect. I likely saw you up in the balcony – lots of people there I was watching, too. I appreciate your kindness, the dedication of Dear Runners to Kevin, all of it. Be well. And stay in touch, please. You’re welcome. I felt like giving Kevin credit was the least I could do. I figured there were plenty more people who actually know you who wanted to talk to you and I’m sure there will be a next time! I was the one sitting next to Angela leaning my chin on the banister and periodically dabbing my eyes with a handkerchief. Kevin’s is the most moving service I’ve ever been to. I could feel the love from all the speakers and everyone present and was amazed to see how many people were there (I knew there would be a lot of people, I just didn’t realize there would be that many). I know it’s sad Kevin is not here anymore but as I looked around the church I thought now this is how it should be. Most of us probably couldn’t pack a church to the rafters! A friend lost a relative recently and fewer than 10 people showed up for the funeral. It may have been partly due to age and location (she couldn’t make it because of the distance), but whatever the reasons it’s certainly not what one hopes for. I thought Kevin’s service was a lovely reflection of his life. It was evident he was much beloved and I gather he excelled at bringing people together so it seemed fitting that people from so many different corners of his life were there. I chatted with some folks I didn’t know as well as catching up with ML folks. 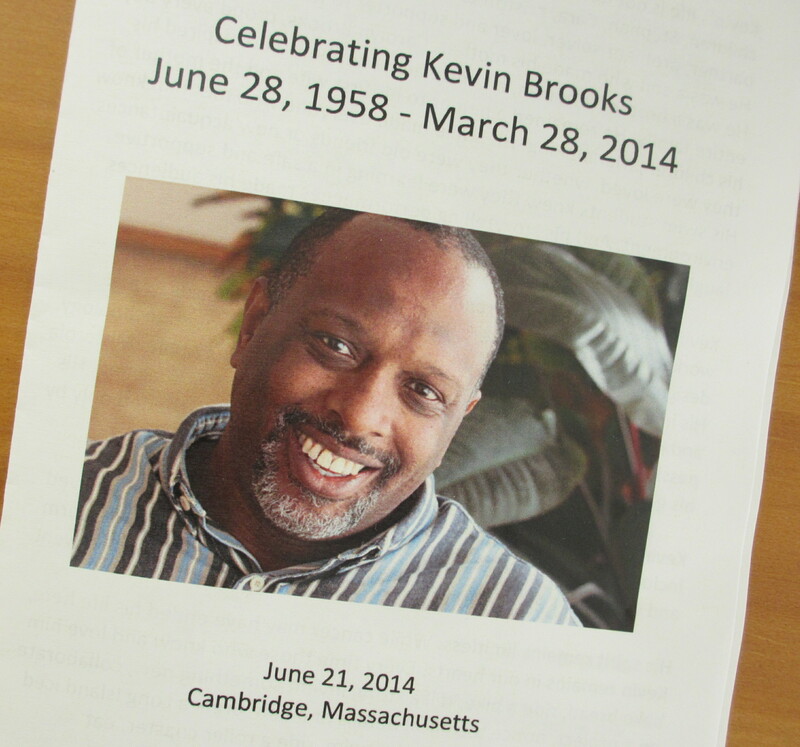 It was a privilege to be there and hear more about Kevin’s life than the piece I knew.